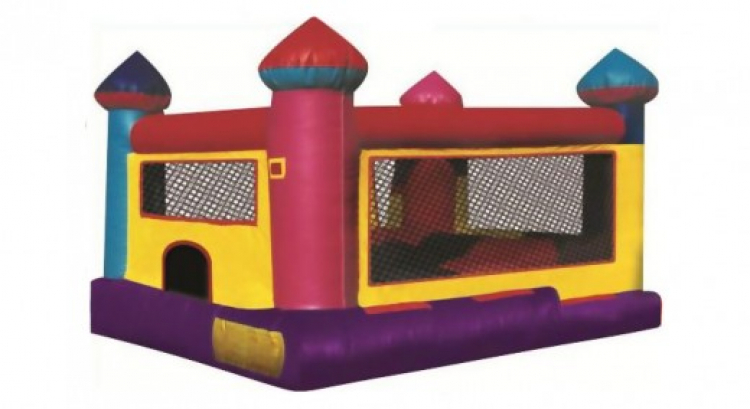 The Mini Castle moonwalk will set forth a regal air at your next event. Don't be fooled by the name, this is a grand chateau where young princess and princesses can spend the day in their make believe world of knights and castles. This unit brings together an inflatable jumper with a ball pit for plenty of bouncing activity and motor skill fun. A horizontal log separates the ball pit from the large jumping area, so players can choose whichever activity they want. This moonwalk is the ideal way to promote social skills, confidence, play and exploration for children, With its vibrant pink, red, yellow and blue and teal hues, and four spires, one in each corner of the castle, all participants will feel like royalty. Kids can spend hours jumping, making friends and even pretend they are decreeing royal edicts upon their kingdom. This Mini Castle moonwalk is perfect for any prince or princess party. Check out this unit dimensions, it can fit in a garage or other small open area. Price: $149.00 per 7 / hrs. Price: $149.00 per 3 / hrs. Price: $149.00 per 4 / hrs.